For more information, see the Atheist Debates video on What are the odds?. The 747 Junkyard argument, also known as the tornado argument, is made by creationists and proponents of intelligent design and states that attributing the development of life to natural forces such as evolution by natural selection is like expecting a tornado moving through a junkyard to result in a fully functional Boeing 747 aircraft. The argument was originally made by British astronomer Fred Hoyle. This analogy depends on a fundamental misunderstanding of the "randomness" involved in the development of life, as well as a blurring of the separate issues of how life arose from non-life and how subsequent life developed from earlier living things (the jet is clearly supposed to suggest the complexity of current living organisms). ID advocates sometimes present calculations showing the impossibly low odds of a given protein spontaneously self-assembling from a batch of amino acids. William Dembski uses this approach in his paper . Such calculations are irrelevant because they ignore important features of proposed evolutionary mechanisms — the very features that get around such seeming impossibilities, in fact. "The chance that higher life forms might have emerged in this way is comparable to the chance that a tornado sweeping through a junkyard might assemble a Boeing 747 from the materials therein." "The trouble is that even a simple protozoan, or a bacterium, requires the prior formation of about 2,000 enzymes, themselves also complex proteins, which are critical to the successful formation of all the other 198,000 or so requisite proteins. The odds in favor of the accidental formation of all 2,000 by accident (never mind the other 198,000), without which no living organism could have come into existence, approaches a truly infinitesimal magnitude. [... Hoyle] says that anyone foolish enough to believe that the solution to the life-problem might just come about by accident is guilty of a "junkyard mentality." 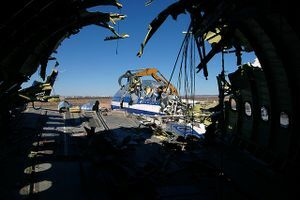 [...] He asked somewhat earlier, and asks again in his 1983 book, what are the chances that a tornado might blow through a junkyard containing the parts of a 747 and just accidentally assemble it so as to leave it sitting there all set for take-off." The argument is a form of argument from design because a specific trait of a class of objects is said to imply the object was designed. The components of a system (such as parts of an aircraft or a biological system) have many possible states or arrangements. The vast majority of states are broken or invalid. From (1), the probability of a correct or valid state being randomly selected is very low. There is only a finite time and therefore only a limited number of configurations could actually have been randomly assembled and tested. From (2) and (3), random assembly of the system almost certainly did not occur. From (4), therefore a different explanation for the system's assembly is almost certainly required. The tornado argument depends on the common fallacy of equating "natural" explanations of life with "randomness". Only a small part of evolutionary theory is actually based on randomness. Genetic mutations and natural genetic variation present in populations are, to a large extent, random; and the kinds of selective pressures encountered by individuals (predation, food supply fluctuations, etc.) are to some extent random in nature. However, the differential benefit of one characteristic over another in dealing with these environmental pressures (that is, the "fitness" part of "survival of the fittest") is not random. Some adaptations are clearly beneficial to the organism and some are clearly not. This means that Darwin's proposed driving force behind evolution, natural selection, is anything but random. In addition, evolution doesn't work quickly by way of massive, uncontrolled forces, as tornadoes do. Evolution theory suggests that small changes, accumulated over extremely long periods of time, result in the current diversity of life. Most importantly, the tornado analogy lacks the two main elements that make evolution work: reproduction (which enables "descent with modification") and selection (which enables increasing complexity). The lack of these aspects reinforces the improbability of anything useful coming out of the process. If rephrased to account for time, natural selection and different outcomes, it should be asked what the odds are of achieving some functional transportation device from a tornado moving through a junkyard of airplane parts for three billion years, where any parts that combine successfully remain while any parts that do not match will not stay together, and assuming that no parts are ever damaged and they are interchangeable. The fact that the argument posits the creation of a working aircraft reveals another misconception: that evolution has as its goal the creation of complex living organisms. This is a case of unwarranted anthropocentrism. Evolution has no final goal or purpose; it is merely a consequence of variation among individuals coupled with environmental pressures. The kind of calculations made by Dembski are based on (or perhaps intentionally rely on) a fundamental misunderstanding of what probabilities should actually be considered. The odds of a particular group of amino acids assembling into a particular protein may indeed be small, but the kinds of amino acids and proteins that current life is based on are not the only ones possible. Indeed, even the mixture of atoms that life on Earth is primarily based on is not the only possibility (see Wikipedia:Alternative biochemistry). And at the other extreme, the current range of living things we see around us are not the only possible life forms that could have evolved. To claim that a random outcome is significant because it merely occurred is an example of the Texas sharpshooter fallacy. To illustrate the previous point with another analogy, consider the probability that Dembski's own parents would create a child exactly like Dembski. The odds are astronomical. But, of course, they did. On the other hand, consider the probability that Dembski's parents could create any child. Those are much better odds. "[Skeptics argue that] the analogy of a 747 is quite uninteresting since there are conceivably multiplied billions of possible aircraft designs, not to mention designs for other vehicles yet to be imagined." To explain an ordered in a complex system with an even more complex and ordered system only introduces further difficulties to the original problem. If a complex system is unlikely to naturally occur, God is even more unlikely to naturally occur than an ordered universe. For this reason, Dawkins turned the 747 Junkyard argument upon itself and called God the Ultimate 747. No specific God is proved by the argument. It is usually assumed, by false dichotomy and argument from ignorance, that the only alternative explanation is an intelligent designer. Even if we accept the current state of the universe is improbable, that does not mean it is impossible that it has occurred by chance. Similarly, if we accept that a God would have a higher probability that he would create the universe (which is almost impossible to demonstrate), we cannot simply accept that as the explanation. We don't know the events' prior probability (also called its base rate). There may be other explanations that are more probable. For this reason, this argument is sometimes referred to as the lottery fallacy or the base rate fallacy. "If we were to flip a fair coin, the odds of it landing heads side up is 50%. What if I were to say that 'I want to place his coin down on the ground heads side up.' What are the odds that it's going to be heads side up based on that? Nearly 100%. I could screw up a little bit, I'm not perfect. But it's way better than 50% as to whether I can set a coin on the ground heads side up. So if the argument is 'this is more likely then you should believe it', then every time you find a coin anywhere in the world that is heads side up, you should believe that it was placed there by a thinking person who intentionally placed it heads side up, [and] that is the most plausible explanation. And I think that we all realize that is actually not the case." The argument draws an analogy between the universe and a junkyard. However, the universe is incomparably bigger and has existed for billions of years. Also, the universe contains many processes, including "heat or cold, attraction or repulsion, and a hundred others," not just random selection by tornadoes. This makes the analogy very weak. "Admirable conclusion! Stone, wood, brick, iron, brass, have not, at this time, in this minute globe of earth, an order or arrangement without human art and contrivance; therefore the universe could not originally attain its order and arrangement, without something similar to human art. But is a part of nature a rule for another part very wide of the former? Is it a rule for the whole? Is a very small part a rule for the universe? Is nature in one situation, a certain rule for nature in another situation vastly different from the former?" For the universe we can see, observations fit abiogenesis better than a designer God. "If there is no God that designed the universe and designed life, first it would mean that life is a chemical accident. It is a very improbable accident that is true. That means for something like that to happen, the universe has to be really old and really big. There's lots of chemistry sets practising and creating molecules before one of them will come up. It's like a lottery: the odds of winning are low but if you have a million people playing, one of them is going to win. So if you see a lottery win, you should expect there are millions of players. And that is the case here. The [universe we would expect] is vastly old and vastly huge. And look, that is the universe we see." Evolutionary straw men Life just exploded from nothing · So you think we came from monkeys · How did the first dog find a mate · Crocoducks · Banana argument · 747 Junkyard argument · Irreducible complexity · Chuck Missler's jar of peanut butter · What good is half a wing? This page was last modified on 18 March 2019, at 04:40.